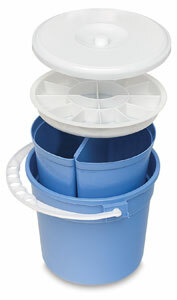 The durable plastic brush basin cylinder is a great accessory to have at your side as you paint. It's also handy for transporting items to and from the classroom or studio. The basin contains two 2-liter water buckets, a 16-compartment palette, and a handle that doubles as a brush holder. ® Richeson is a registered trademark. Hint — click a thumbnail to enlarge.